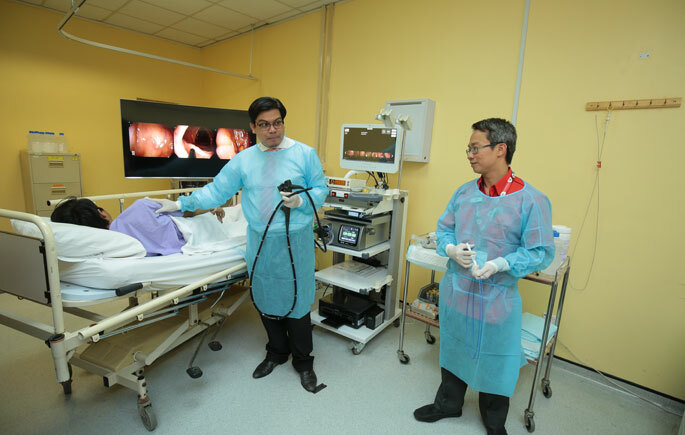 CHERAS, 16 June 2017 – Universiti Kebangsaan Malaysia Medical Centre (UKMMC) is the first government hospital equipped with a Full Spectrum Endoscopy (FUSE) technology to detect polyps, which are growths on the colon wall. FUSE is a flexible system which has a 330 degrees angled tube camera to detect polyps in the colon. “Polyps, takes between 10 to 15 years to develop into cancer and most people who are afflicted with colon cancer were men aged 50 years and above,” said UKMMC Gastroenterology and Hepatology Consultant, Associate Professor Dr Raja Affendi Raja Ali. 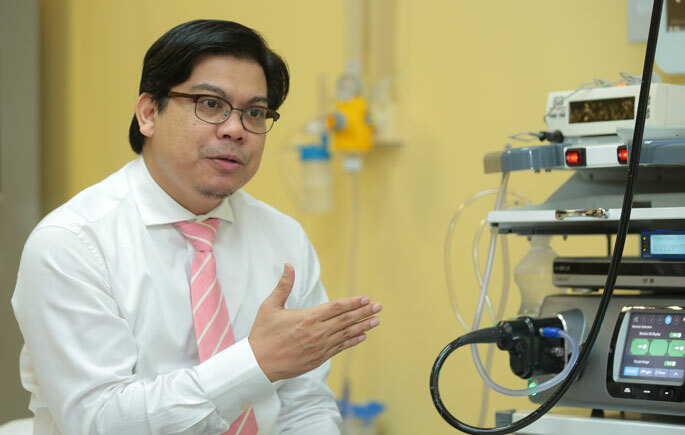 According to Dr Raja Affendi, endoscopy is a procedure to diagnose internal surface involving the oesophagus, stomach and duodenum using flexible camera tubes called endoscope. “This technology is called full spectrum because the tube has a system camera with views from the side, left, right, top and bottom. “FUSE has a camera coverage of 330 degrees, while the existing system of endoscopy here is limited to 170 degrees only,” he explained. He said conventional endoscopy system could not detect polyps, which may be subtly hidden in the ‘folding’ intestinal. So, the use of FUSE can accurately identify areas of polyps, due to the nature of the flexible tubes which allows it to look at uneven and pleated small and large colon surface. With a combination of sophisticated program, FUSE has been set to receive a combination of multiple high-definition (HD) video signal to translate the display seen at monitor on the high range of 4K. Meanwhile, Head of UKMMC Endoscopy Service Centre Associate Professor Dr Ngiu Chai Soon said the process of removing the polyps does not usually involve surgery. “Polyps detected during the test screening will be discarded in full during the process of endoscopy using wire coil forceps. “This coil will grip the polyps until polyps detached from the intestinal wall,” he explained. He said that the Endoscopy Service Centre receives about 25 patients outside of Kuala Lumpur include Penang, Johor and Perak, daily. The FUSE machine was generously donated to the PPUKM by the Waqf Selangor Muamalat.